Having finished up my favourite mascara last week and not quite taken by the Lancome Oscillation one, I opted to test the next mascara that I had at my disposal. 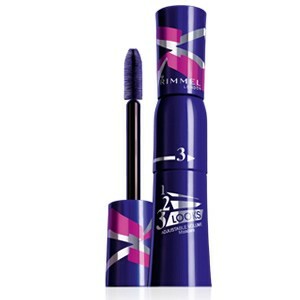 Supposed breakthrough adjustable volume mascara – a dial to turn for 3 settings to achieve 3 different glam looks in 1 mascara! With the dial base, I found the mascara harder to open up in the mornings (I know I'm still sleepy, but the dial mechanism sure isn't helping). The dial setting is supposed to give adjustable looks with 1 being the most natural looking and 3 being the most full and dramatic look that you can achieve. Obviously I amp it up to the max with setting 3 but found that there was too much formula on the brush with that setting. Instead I do the first coat in setting 1 and once my lashes have built up some thickness, adjust it to 2 and give it a second coat to avoid over clumping. I sometimes still have to use a brush comb to de-clump and remove excess mascara from my lashes - not so good when I'm in a rush. I think I'll stick with setting 1 from now on and just do an extra 3rd coating. Comes with a full bristled but short-sized brush so you can get into corners of eyes and lower lashes with ease. While I'm used to a larger and longer brush with my Max Factor False Lash Effect (my current benchmark when comparing all mascaras out there), it does do an effective job and is quite comparable in terms of results. However because of the smaller brush, it takes me longer to get the same effect. Not prone to smudging but there was slight flaking during the day. Provided a great lift to my straight lashes and wasn't clumpy on setting 1. It does give lashes closest to my favourite mascara in terms of volume and length (after a comb through) but my search will continue for something easier to use. Not a bad mascara, but the dial settings failed to do much for me. Sometimes, simple and easy to use features give the most effective products. Rating: 7/10 The formula isn't bad whilst the 1 2 3 dial is gimmicky and the brush too small for my personal liking but that's just fussy old me for you. RRP A$18.95 at Priceline, David Jones and all good pharmacies. Hopefully sometime in the next week, I'll do a post and list the mascaras I'd tried over the years that were underwhelming on my lashes so be sure to watch out for that. Which mascara have you tried that didn't perform as it claimed? Ah Thanks Mel. You're just so sweet :) I'm glad you enjoyed it. You can count on me to dish the dirt on all of it.. the good and not-so-good. I do like the mascara, but probably a weekend mascara for me rather than workdays just because I'm time poor (aren't we all) and I need it to be fail-safe and fool proof which this isn't yet.